Astronaut Stephen Bowen floats outside the International Space station on the second spacewalk of the STS-132 shuttle Atlantis mission. May 19, 2010. This story was updated at 4:49 p.m. EDT. Two spacewalking astronauts began a tricky battery swap onthe space station's solar arrays Wednesday, a job that is expected to take twofull spacewalks to complete. Atlantis mission specialists Michael Good and Stephen Bowengot ahead of schedule, successfully installing more than half of the newbatteries. In addition, they were able to fix a snagged cable that was plaguinga sensor camera on shuttle Atlantis and tighten the connection between a stuck antennaand its stand. It was the second of three planned spacewalks, orextravehicular activities (EVAs) for the shuttle Atlantis' 12-day STS-132mission, the orbiter's final planned spaceflight. "We had a really successful EVA today," lead spacestation flight controller Emily Nelson said Wednesday. "We're all incrediblyexcited. I don't think Mission Control could be any more proud." Overall, the spacewalkers spent a little over seven hours floatingoutside the space station, and ended the spacewalk at 1:47 p.m. EDT (1747 GMT). 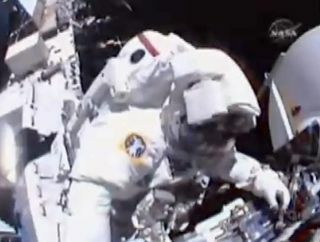 "Seems to me you guysare cruising, like you're riding a tsunami," spacewalk coordinator TonyAntonelli said from inside the space station at one point, commenting on how quicklyGood and Bowen were moving through their checklists. The spacewalkers exited the hatch of the station's Questairlock ahead of schedule, beginning the excursion at 6:38 a.m. EDT (1038 GMT). Bowen swiftly dispatched with the cable task, easily findingthe spot where a cable connecting to a camera on Atlantis' sensor system wasstuck, restricting the camera's motion. He was able to wire-tie that cable toanother cable nearby to ensure it doesn't get caught again. "All right, there itis," Bowen said, wrapping up the job. The camera is a tool used to scan the orbiter's sensitive heatshield to make sure it is intact and safe for the return trip to Earth. Shuttleastronauts conducted their usual inspection of the heat shield Saturday, a dayafter Atlantislaunched into space. They had to switch to a backup camera, though, whenthe primary tool couldn't move and tilt fully because of the pinched cable. Now the camera should be in working order, and available touse if any further inspection of Atlantis' heat shield is necessary. After fixing the sensor camera, Bowen moved out to join Goodat the far-left side of the orbiting laboratory, a spot called the P6 truss.There, the astronauts began their major task of the day: swapping out a set ofaging solar array batteries with brand new ones. The location also afforded a nice perspective on the Earthbelow. "Steve-O, the view's not bad from out here, huh?" Goodsaid, calling Bowen by his nickname. "Yeah, it's incredible," Bowen replied. The spacewalkers got to work removing the old batteries fromthe station and exchanging them for new ones brought up to space by Atlantison a cargo carrier. For each swap-out, they had to move the old battery off thestation and onto a temporary stowage platform, then secure it down on the cargocarrier, after making room by lifting out the new one. Because each battery is large and weighs a hefty 375 pounds(170 kg), the process is more complicated than it sounds. Nonetheless, the jobwent swiftly and smoothly. While Bowen and Good were only supposed to installthree of six new batteries on this spacewalk, they managed to dispatch withfour of them. That leaves only two more batteries to be installed by Goodand mission specialist Garrett Reisman on the mission's third and final spacewalk,set for Friday. The new batteries will help outfit the space station for thecoming years, especially for the era after the spaceshuttles are retired at the end of 2010. The batteries are designed to last6 1/2 years, but the old ones have been functioning even longer. NASA hopes to keep the space station running through 2010,with unmanned cargo ships, Russian Soyuz spacecraft and possibly even U.S. commercialcrew vehicles traveling to and from the orbiting lab. None of these, however,can carry as much cargo as a space shuttle, so the final shuttle flights areaimed at toting up as much large hardware as possible. The spacewalkers' final task was to try to tighten theconnection between a spare space-to-ground antenna and its pedestal-like boom. The antenna, which will serve as a backup for communicationsbetween the space station and Mission Control centers on Earth, was deliveredby Atlantis and attached to the station during the mission's first spacewalk onMonday. Those spacewalkers weren't able to complete the installationbecause they noticed a gap between the antenna dish and its boom that theycouldn't close. But when Bowen and Good went back to the site, they were ableto crank the bolts tight enough to secure the antenna. "Today was just an incredible, incredible EVA,"said STS-132 lead spacewalk officer Lisa Shore. "We accomplished more thanwe ever hoped going out the door." SPACE.com is providing complete coverage of Atlantis'STS-132 mission to the International Space Station with Senior Writer ClaraMoskowitz and Managing Editor Tariq Malik based in New York. Click here for shuttlemission updates and a link to NASA TV.